Two weeks ago I was in Geneva, Switzerland for a business trip. In addition to the usual excess of Cheese Fondue I also had some really wonderful foamed dishes at a friend's house and in a nice restaurant. So I decided to try this myself. 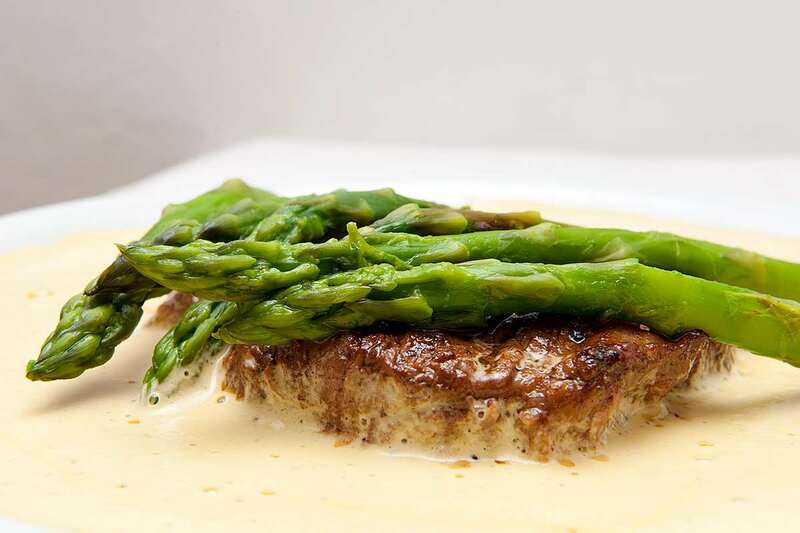 I read up on the theory of culinary foams in , bought a food and cream whipper and tried to use theory and device to create a recipe of Espuma of Chanterelles with Filet Mignon and Asparagus. Surprisingly enough, the experiment worked out really well and resulted in a wonderfully light and very flavorful chanterelle sauce. For this recipe you will need a cream whipper that can be used for hot sauces. I bought a which seems to work really well. In a heavy pan heat up olive oil over medium heat, add whole garlic clove and cook until golden brown. Reduce heat, add shallots, cook until softened, do not brown. Add chanterelles, cook until soft. Add spices, white wine, chicken stock and water. Simmer for another 5 minutes. Puree with a stick blender, strain. Temper the egg yolk by whisking in small amounts of chanterelle puree, then whisk egg yolk into the puree. Use the stick blender to slowly blend in the melted butter. The sauce should be a smooth emulsion. Fill into cream whipper, charge (per instructions, I used two chargers). Keep warm in a water bath while you cook the steaks and the asparagus. Heat oil in heavy pan. Cook the steaks to the desired degree of doneness (6 minutes per side for medium-rare and the typical steak thickness here). Let rest for a few minutes before serving. Season with salt and pepper. Spray a thick layer of sauce on warm plates. Add the meat and the asparagus. Serve immediately. The foam also tastes really good cold. Instead of keeping it warm, place the cream whipper in the fridge for a few hours. The cold foam will be lighter and more stable. The recipe looks lovely but you do not mention how to cook the filet mignon?????????????? Thanks for pointing out the missing part. That's fixed now.